Perhaps one of the most popular form of arts. Not as popular as portrait paintings, but plays important roles in human advancement in scientific studies and medicine. 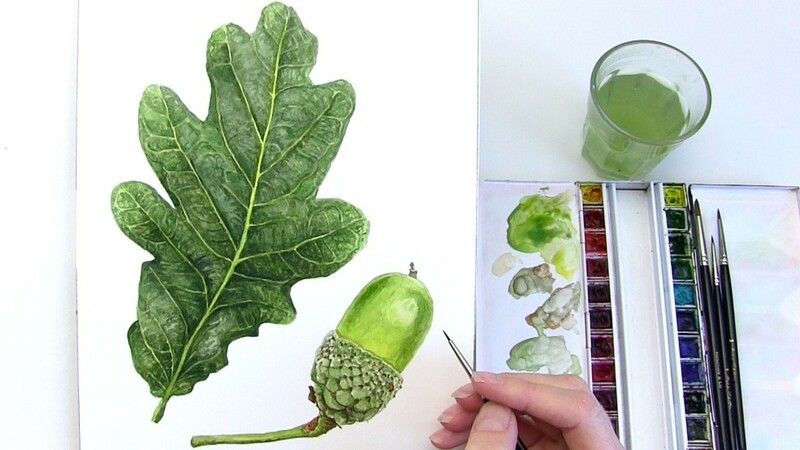 Same at any other form of arts, botanical paintings evolved from thousand years ago. Anyway, they play different roles with the advancement of technologies. Today, we have better ways to record botanical specimen, and at the same time the botanical arts helps to deliver what the modern technology cannot do. 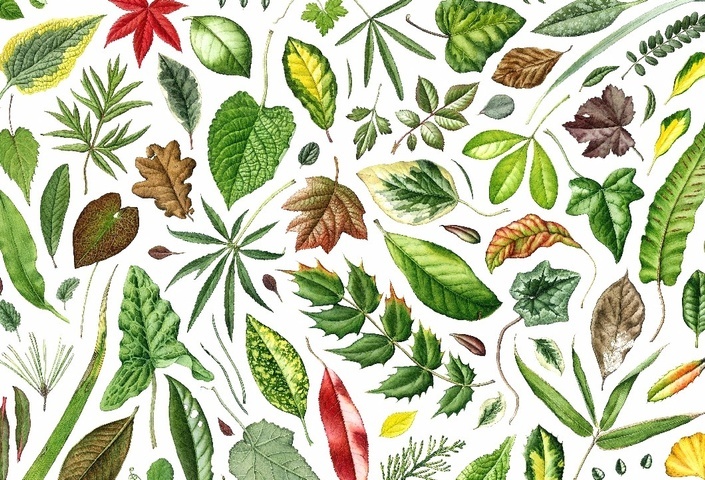 Botanical arts or paintings were used in order to recognize types of plants that can be used for medical purposes, or plants with commercial values such as herbs and spices. 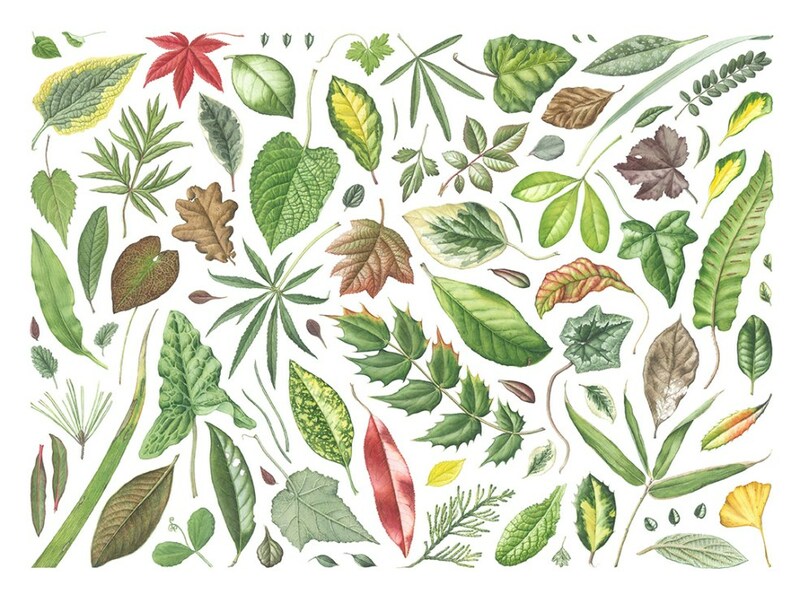 When the botanical knowledge getting larger, the botanical paintings/illustration helps to segregate plants into their family and species that also helped human to develop new crops that produce more yields or immune to some diseases. Today, botanical artist can choose to fulfil all of these purposes. They have a broad range of purposes in delivering their arts. They can do botanical illustrator with high accuracy details, in order to help botanist to recognize plant species for recording purposes. They also can do botanical art to show their subject’s aesthetic value. 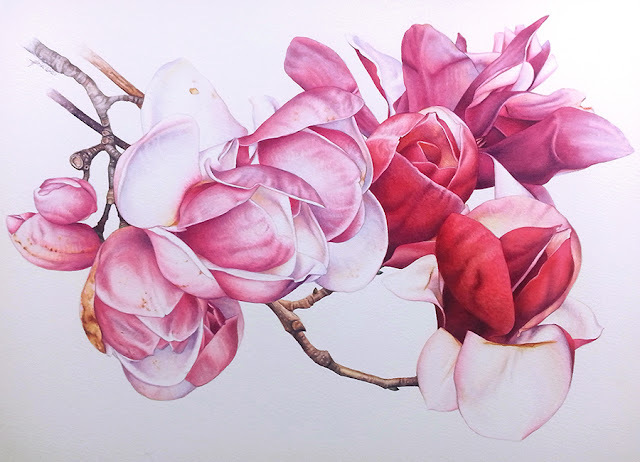 This type of art is the best to medium as an introduction to those who never get exposed to botanical illustration or botanical art before. The last approach that artist can do is through flower painting, without accuracy. This creative approach just as any other painting by representing plants just by artist creativity and imagination. No matter which types of approaches that you are working on, botanical art is one of the best ways to preserve the plant specimen. 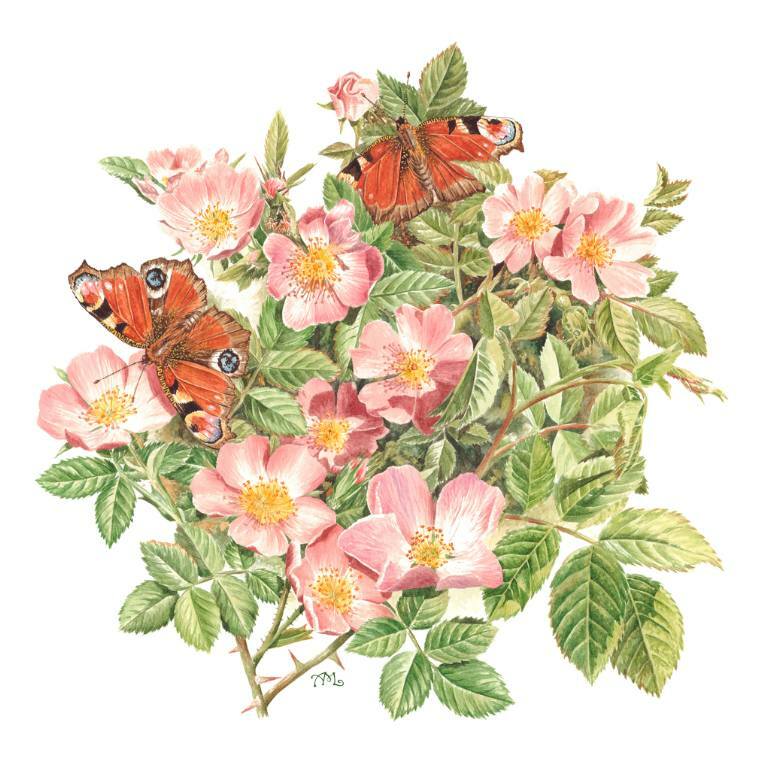 Today, botanical artists can produce higher accuracy illustration and arts with the use of higher quality materials. 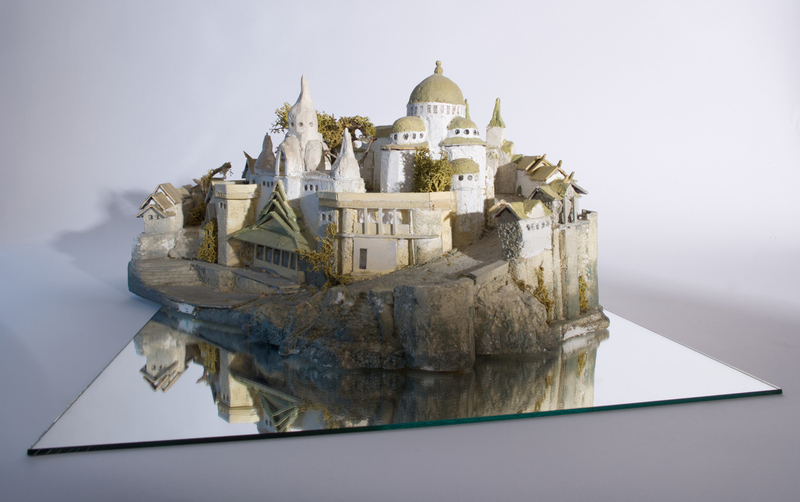 The artist’s hard work, then share for many other viewers, through publication and exhibition. This beautiful result not only works educational medium, but also as piece of art at the same time. There are many botanical artists out there that sharing their knowledge through free and paid courses. You don’t have to be as good as the professional botanical artist to help recording the backyard’s specimens - just follow few important keys to make sure you are doing it right. We will see some of the botanical artists that we can learn from their YouTube channel. Other than that, we also can learn from books or DVD’s we can buy through online. Visit the exhibition is another good practice to learn from other artist works. We will improve faster when learning from those who already mastered the fields. Hopefully botanical arts will grows among all of us in order to collect botanical data from all over the world. Because plants change so fast (produce new species), without proper record, we might lose many important plants that important to our survival. Enjoy the nature, embrace their beauty. We have learned from few wonderful watercolour artists in the previous article. Here, in order to gain more knowledge, let see another wonderful painter that work on various media include watercolour. 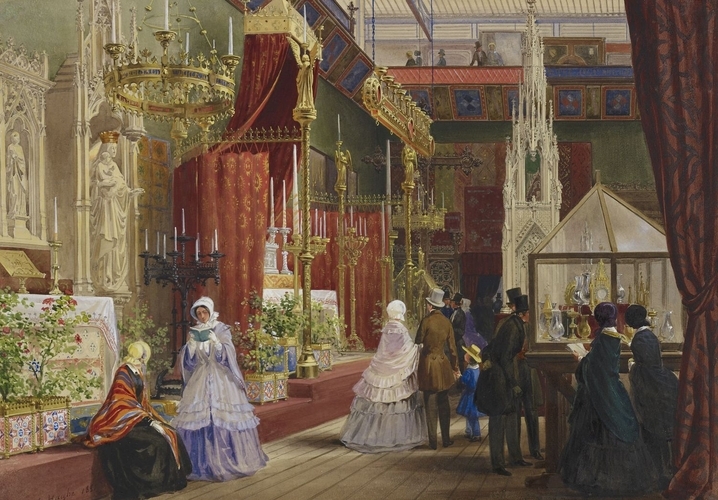 Instead of focusing on how he is doing his watercolour technique, there’re few more important things we can learn from him – the creation of the scene. 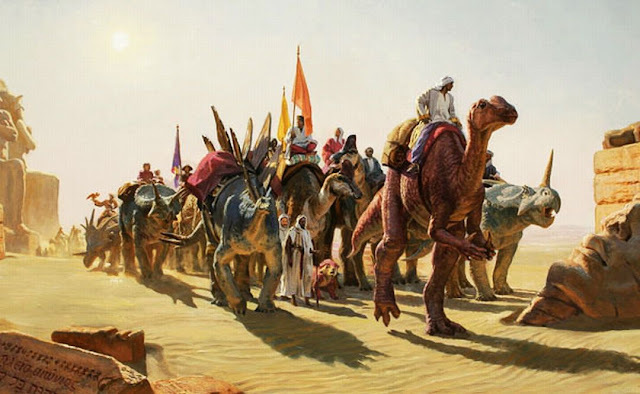 Even though more popular with his creation of dinosaur scenes, James Gurney actually can create almost any scenes through his wonderful techniques. He will do some research about the scenes he is going to create – the objects, the lights, shadows, and the atmospheres through different approaches. From that he is able to produce a realistic picture (for any scene he wants). With Jack Horner at the Museum of the Rockies. Photo by Tobey Sanford. Researching at the Grand Canyon. Photo by: Tobey Sanford. His drawings allow us to see sceneries of the lost world such as dinosaur’s land and ancient civilization; with the information provided by other researchers of palaeontologists and archaeologies. His work can be seen mostly through Scientific American and National Geographic Magazine. 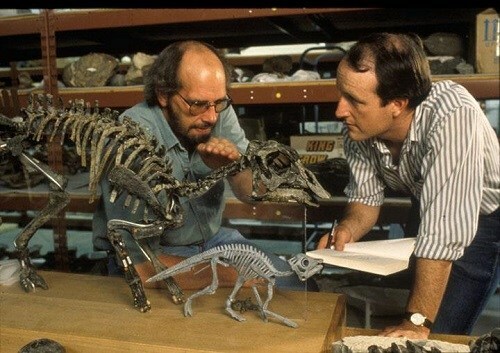 He also produced Dinotopia: A Land Apart from Time, which was published in 1992; showing more illustration of dinosaurs that living among human. The best thing is; he is sharing his knowledge through many platforms; that is also become our great opportunity to learn many things from this wonderful artist. For fast learning of his ideas on how he built the sceneries for his paintings, you can follow his YouTube channel here. There are also a few books by him containing important information on how to produce realistic drawing. These include, Imaginative Realism: How to Paint What Doesn’t Exist, Andrews McMeel, 2009 and Color and Light: A Guide for the Realist Painter, Andrews McMeel, 2010. 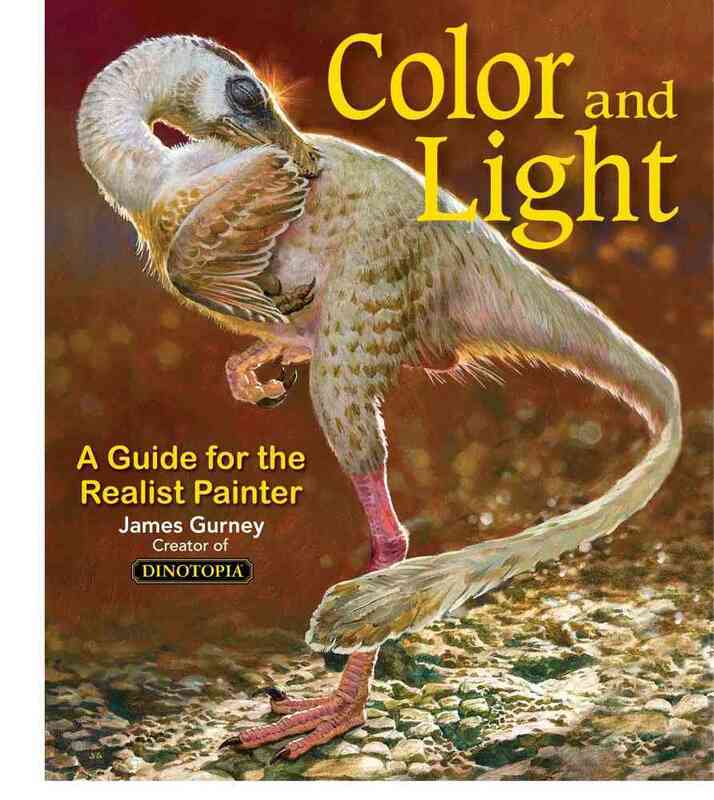 Book; Color and Light by James Gurney. Learn behind the scenes process on how he produced his illustrations from several sketches, built the maquettes, create the composition and finalize the drawings. That’s totally different from what we thought, that the painting process just a process of sketch and paint. If you want to learn more about his techniques, there are also video guides available you can buy in the form of DVD and digital download. From these videos you can learn step by steps to do the drawings. He always shares many other knowledge during the painting process that make the videos more entertaining. To learn more about this wonderful painter, you can visit his website that will lead you many other resources produces by him. 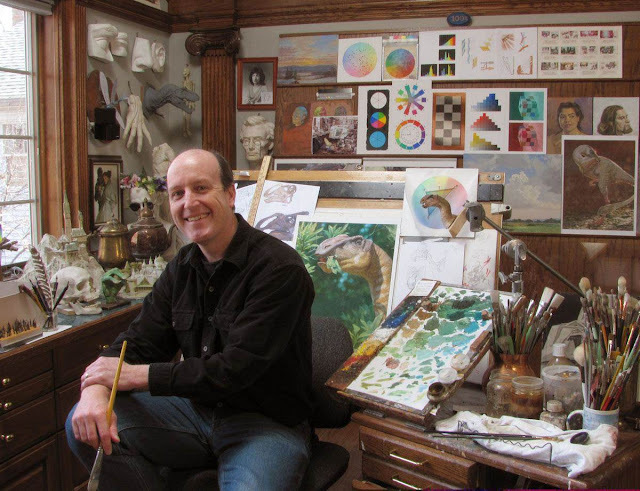 He also writes his daily blog that sharing more wonderful things about drawing and painting. After going through many videos of drawings and paintings, I think James Gurney is one of the best painters that we need to learn from. His techniques will allow us to create our own technique base on the sceneries we want to create – that’s why I come out with this article first. There are many other good videos that we can learn out there that I will share in the next articles. This time we talk about another important subject in watercolour paintings, since watercolour is one of the popular mediums compared to any other materials we used in paintings. Anyway, there are many types of watercolour, and we might want to know what are their differences and which one to use. 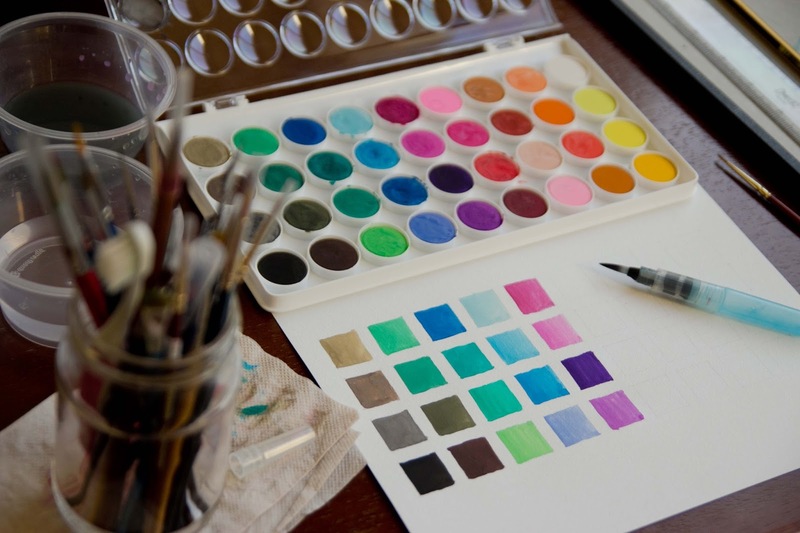 They are cheaper types of watercolours and there is also an artist grade that can cost more expensive. What are their differences? Watercolour is made cheaper for the student grade so it will be more affordable for students to learn. This is possible by changing its ratios of their main ingredients that consist of pigment, gum Arabic, additives and solvent. So, the student grade is totally for practicing only, when we want to be a professional painter, we need to use the artist grade watercolour for a few reasons. Besides their qualities, artist grade watercolour not only have a brighter coloured pigments, but they also blended carefully to have a good texture. Professional artist has different preferences for the texture quality, anyway, this high grade watercolour has far better texture (evenly) than student grade watercolour. Other than easy to apply, watercolour must have the transparent quality as one of the main characters for watercolour that differentiate between watercolours than any other painting techniques. 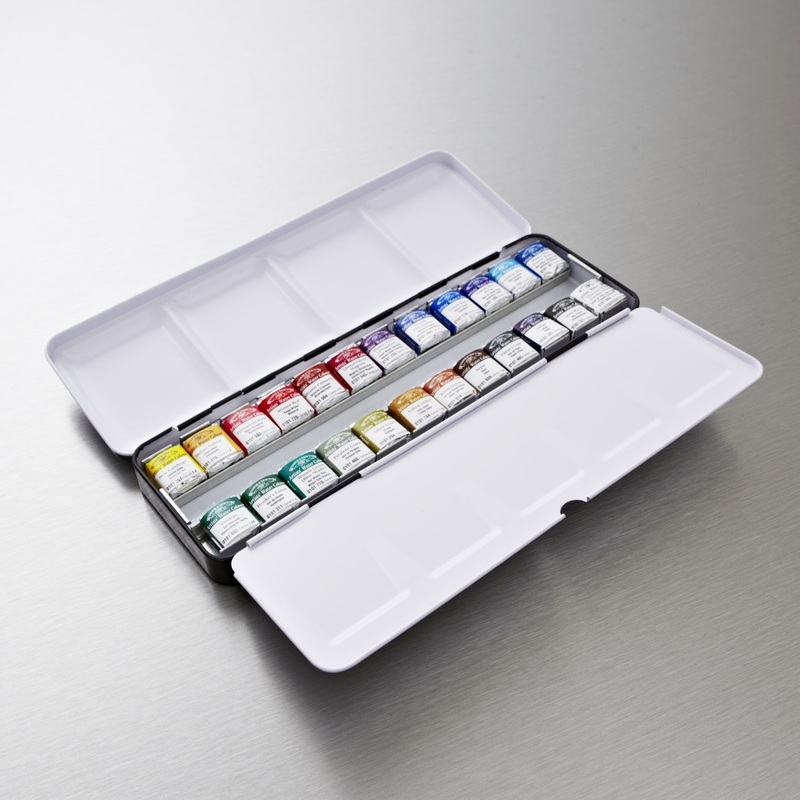 The artist grade watercolour is more lightfast; the quality of the pigment not prone to discolour when exposed to light. This is very important to make sure the painting can be kept for a longer period of time (and increase their value). The lightfast value, usually provided by the watercolour manufacturer in their product’s specification (or you need to contact them to know about the details). Then they are a few different types of watercolour (basically on their packaging). Some of them are coming in tubes while some of them come in pan. Both of them have good quality of pigments, but it’s totally depend on how you use your colours. If you don’t want your colours mixed with each other, then a tube is easier to handle. Anyway, for travelling purposes, pan is always easier. The new types of watercolour also known as liquid watercolour is ready to use types. Mostly they have a brighter colour, but can also be diluted to produce paler hues. This watercolour is suitable for traditional brush or an airbrush technique. Usually it will be used together with traditional watercolour as a mixed media (to give contrast in the painting). 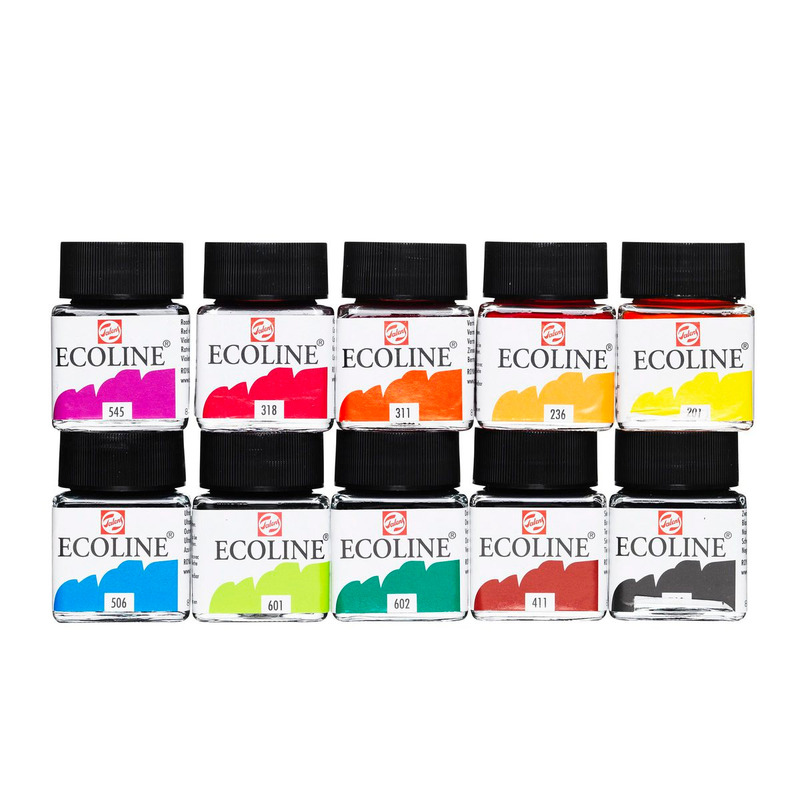 Watercolours are sold in sets of 6 colours up to 36 colours, you might want to know which set to choose. Since colours are produced from three primary colours (Red, Yellow and Blue). You just need to make sure, you have this three main colours first. Then you also might need to have white and black because they cannot be produced by those three colours. Having a bigger set of colours will speed up your painting process, and also producing consistent quality of the colour. It is important to know more about the materials that you use for your paintings. Especially when you think about to sell it to your customers. Good paintings should have durability for storage (this will increase their value), and might be useful as future reference. It’s Okay to have different quality of paints for practicing purposes and for the real paintings. The lobby of V&A museum. As usual, we are going to continue with the next place I visited in London, that is Victoria and Albert Museum or much popular with V&A. Victoria and Albert Museum is a museum dedicated to decorative art and now become the world’s largest museum by housing a permanent collection of over 2.3 million objects. My visit to V&A just after short visited to the Natural History Museum for the first time. So the visit to this museum is around 4 hours (of course it’s not enough). The history of this museum was closely related to the Science Museum as they share the same buildings in their early establishment in 1852. As the collection of arts getting larger and larger the Science Museum needs to separate itself to another location and ended up where it is now. V&A is a very important museum of arts, even though there are many other art museums and galleries all across London and all around Europe. From its early stage, V&A actively collecting art from other countries includes Europe, North America, Asia, and North Africa. At some points, V&A still have their samples preserved in good condition compared to their original pieces. Some of the laquerware from all around the world. Here in V&A, they collected all types of arts from sculptures, paintings, ceramics, glass, textiles, woods, silvers, jewellery, ironwork, prints, photographs, furniture, and many others (yes, all types of arts). That’s what makes V&A one of important museum here in London. It’s opened up your eyes to the whole world of arts, and why it is so important to the development of human cultures. As usual, you can join in any of their free museum tours conducted by knowledgeable friendly staffs or volunteers. This will speed up your learning process about the topics that they will share. As this museum is so big, you might, unsure where you should start and where it should end, unless you planned it in advanced. With a total size of 12.5 acres (5.1 ha), V&A consist of 145 galleries - make sure you check the floor plan carefully, if you are looking for something specifics. Here, there are many things to see and learn about. Instead of just looking at the art pieces, here in V&A there always many things to do. Other than special exhibition, there are also courses, family events, workshops, talks and resources for you to learn more about the arts (library of books and items). 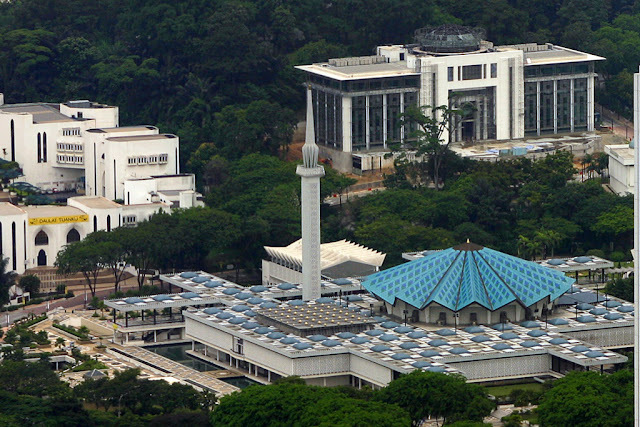 The whole museum itself is result of beautiful architecture with lots of art on it. Museum tour with Jeremy Strachan, educative and entertaining. Important piece from Shah Jahan dynasty, India. As usual, you are encouraged to visit their website to know more about V&A before you visit it. This will allow you to maximize your experience during your visit. You also can communicate with them if you have any question - so, they will be able to assist you (in case you require something not available on the exhibition). At the end of the visit, what I can say is - I need to come back to V&A to see more of the things that I missed on my first visit. I also included another photo album of this museum on my fanpage, you can visit it through the link. Wish I have more time on my next visit to V&A. Kindly share if you have anything to share about this museum in the comments section below, or send it to my email (check the contact form on the web view). Coloured tiles from Islamic cultures. 11-metre high, blown glass chandelier by Dale Chihuly. It’s taking a while for me to work on my London visit’s articles and delay many other posts (for V&A and British Museum). 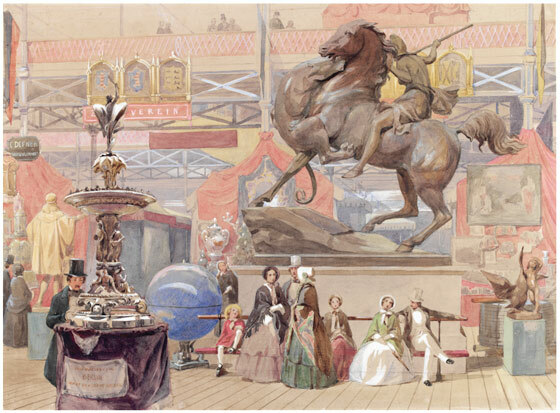 Anyway, before I post the next article about Victoria & Albert Museum, I would like to come out with this article first - the watercolour paintings. Many thoughts that watercolour painting not as good or as pricey as many other paintings especially oils or acrylic paintings. 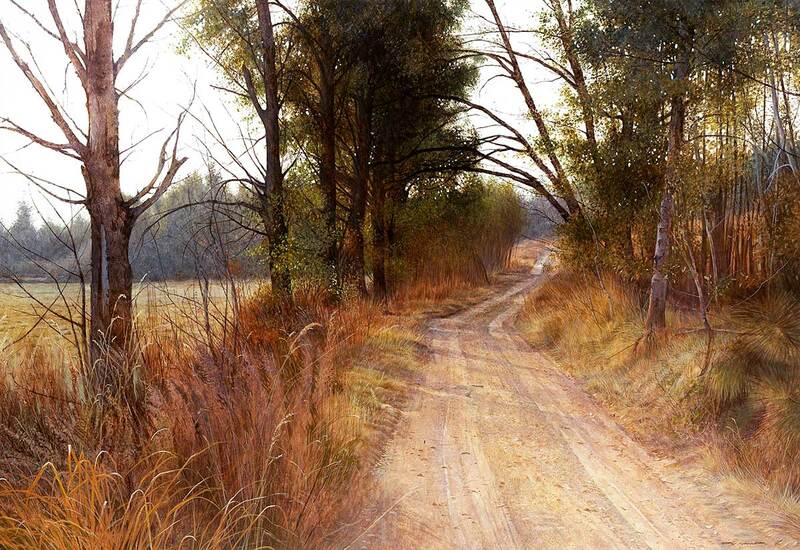 Not to mention about the watercolour techniques that highlighted, mostly showing that watercolour paintings unable to produce photo realistic effect (instead just an illusion of the subjects). In fact, watercolour paintings has been used to record many discoveries/events since long time ago, and I think it’s time again to bring back the watercolour painting to its glory. Watercolour whether on its own, or use together with other media can really come out with better results. In some cases mixed media were chosen for a few reasons; to speed up the process, to bring out certain effect that cannot be achieved by using only watercolours. There’s no wrong in using the mixed media as long as it’s not ruining the result – or the painting still can last longer for future storage. By using the right watercolour techniques, it’s still possible to show every detail in watercolour painting, especially on how important it is in recording information. Here we will see some samples of watercolour paintings that used to record botanical species of plants and also a painting to record an important event. Watercolour has various techniques that allow it to produce different results. However, before we get more details on the watercolour techniques, we also need to know there are many types of watercolours. 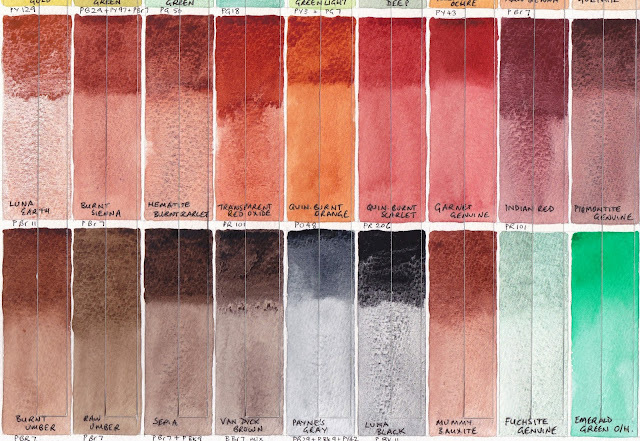 There are few types of watercolour itself (from student grades to artist grades). Other than that, beginner also might get confuse watercolour with gouache and also poster colour. One thing to remember is that watercolour has transparent quality that make it different from any other colouring media. 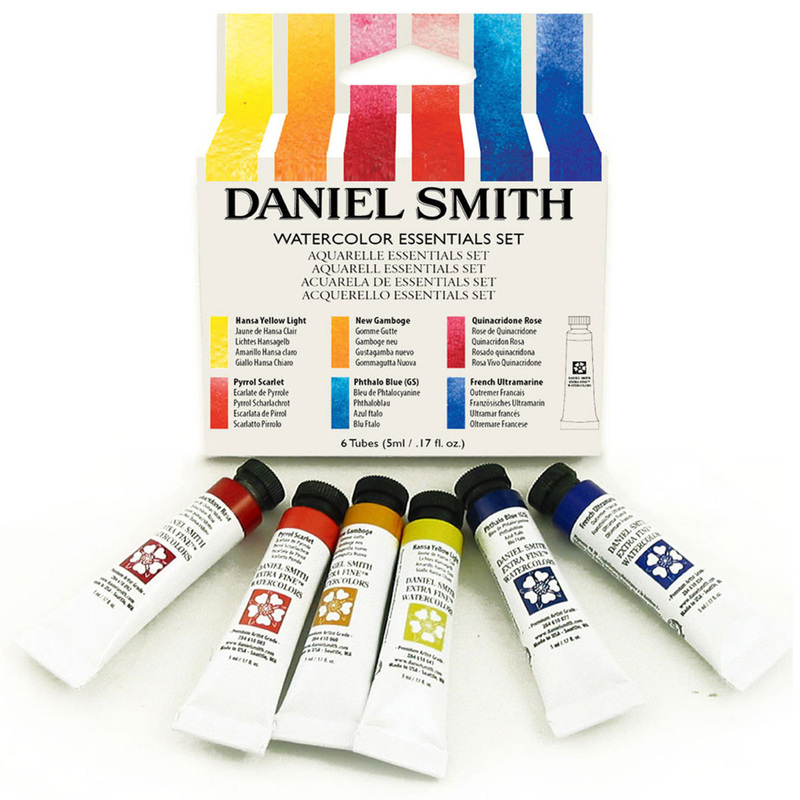 The good quality watercolour has better transparency and the same time have brighter colour from the colour pigments. Some artist grade watercolour can be very costly - so take your time to practice to make sure before investing on higher price watercolour. * Check this link for more watercolour techniques. You will keep listening these techniques being mentioned when you learn the watercolour techniques through video tutorials. It’s easy to understand, but you need to try it by yourself to master the techniques. Usually one or few of the techniques used together to produce on paintings. We will see that in the next section. As many people think that watercolour is one of the hardest media to use for paintings, so we need to have proper training in mastering the watercolour techniques. 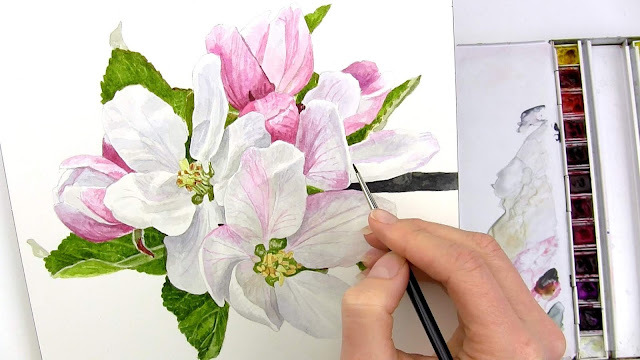 Luckily, with the availability of YouTube, many watercolour artists share their techniques through video tutorials that make it easier for us to learn. So here, I will share few watercolour artists that I found through YouTube where we can learn so many things from them. Before we go any further, all we need to remember is, there’s no limitation on the techniques that we should use with watercolour. So we need to explore as much as we can to know which one is suitable with our drawing styles. Anna Mason from AnnaMasonArt is one of the best examples of watercolour painter. 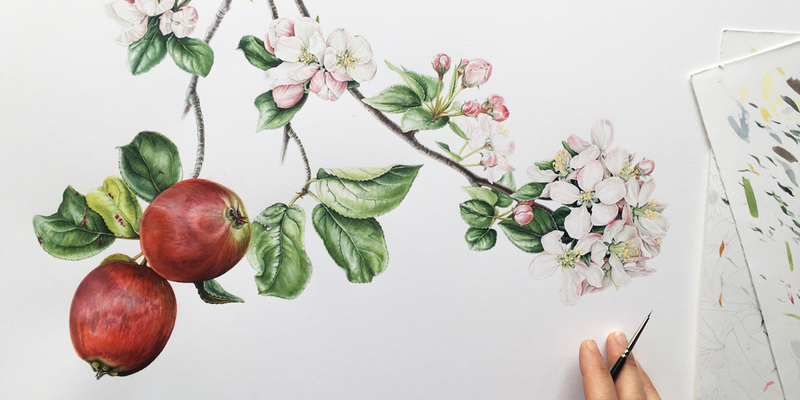 She wonderfully transforms watercolour painting back to how it was used to be. Anna, successfully producing photorealistic paintings with watercolour. Even though mostly focusing on nature, her paintings are so beautiful and lively – make her customers very proud to have her paintings (prints and the originals). The best thing about Anna is, she also provided free video tutorials through her website; annamasonart.com, and it’s available to everyone. With Anna’s techniques, it is suitable if you like to paint the nature subjects. This is very important for natural and history paintings. Mateusz is a comic painter located in Japan. He uses lots of watercolours in his paintings. 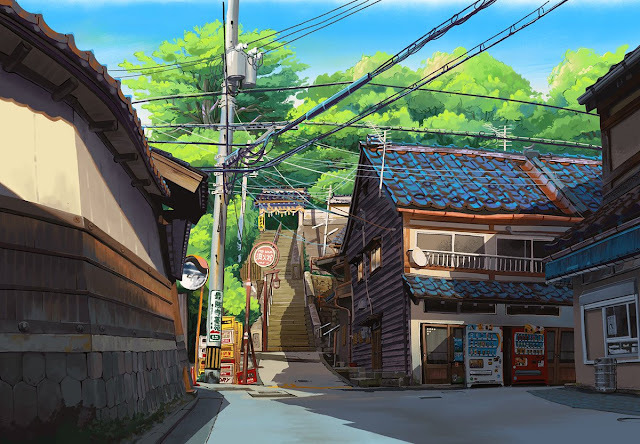 Influenced by Studio Ghibli’s styles of paintings, Mateusz also paints backgrounds for animations, books and magazines. With his styles, we learn different techniques that using watercolours, mixed with black ink pen. You can watch most of his videos from his channel MateuszUrbanowicz on YouTube. This type of paintings suitable if you want to produce comic style paintings, but it’s still nice for landscape and informational brochures. Mateusz also produced a book that illustrated of storefronts in Tokyo with his techniques – that’s I find amazing. Laovaan is a stylist watercolour painter. He uses mixed media with contemporary subjects. You will see his painting with bright colours because he used ink watercolours mixed, and sometimes also colour pencils and marker pens. 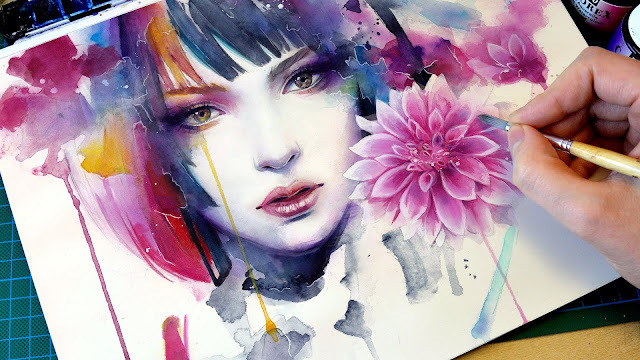 He is popular with his digital style watercolour paintings with manga character styles – this is so popular with manga lovers. You can follow his videos through YouTube channel; Laovaan. He also has his own patreon channel if you want to follow his styles seriously. Stan Miller is one of the popular painters in watercolour and egg tempera medium. 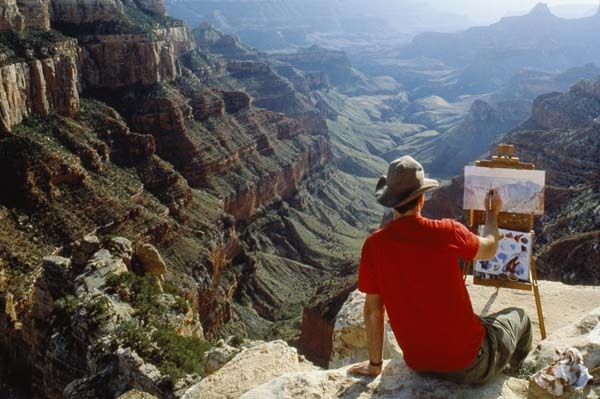 Instead of just doing a painting he also conducted classes throughout US and sometimes overseas. His art not focusing on to be photo-realistic, but truly amazing to watch. To know more about his techniques you can visit his YouTube channel; Stan Miller, visit his website; stanmiller.net or search his name on the YouTube – because there are videos about his work on different channels too. There are many other amazing watercolour painters out there where we can learn. Learning from different painters will allow us to explore as many possibilities as we can, to come out with styles that suits us. Even though we want to create the best art with our works, don’t forget the most important elements doing it - enjoy it! Sharing your works and your thoughts on the comment section below or send it to my email using the contact form (available on web version view).